The Consumer Research Laboratory is a state-of-the art facility and is a part of the Canada Research Chair (Tier II) awarded to Wilfrid Laurier University faculty member Tripat Gill. The lab enables our marketing faculty and graduate students at Laurier to conduct high-quality, controlled research, in a dedicated space. The lab was officially opened on Nov. 28, 2012 and has been funded by grants from the Canadian Foundation for Innovation, the Ontario Research Fund and Wilfrid Laurier University. With grants totalling almost $95,000, this lab has been designed for experimental studies, online data collection and analysis, and much more. 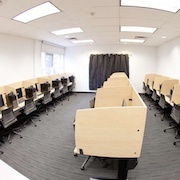 The laboratory is equipped with 20 computer terminals, which include Qualtrics software for study design and survey-based, online data collection. The terminals also include MediaLab software for designing studies and measuring response times to specific tasks, as well as SPSS software for data analysis. Equipment to record thought protocols as well as a small break-out room with a one-way mirror provides for focus groups, interviews and other tasks relevant to research studies. Any research conducted in the lab must be registered at the lab before its implementation. The director of the lab and lab administrator must approve the use of the space and its resources before any project is implemented. To reserve space in the lab, please contact Tripat Gill at tgill@wlu.ca. Note: Priority will be given to Marketing faculty in the Lazaridis school of Business and Economics. All research conducted in the lab must have received prior ethics approval from the Laurier Research Ethics Board. Supported by: SSHRC Insight Development Grant. Researchers: Richard Klein (University of Florida), Kate Ratliff (University of Florida), Brian Nosek (University of Virginia), Grant Packard and 47 other authors.